Timothy Peter Pigott-Smith aka Tim Pigott-Smith (13 may 1946 - 7 april 2017) was a British film and television actor and author. 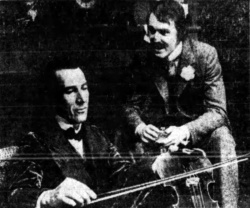 From 12 november 1974 to 3 february 1975, Tim Pigott-Smith played Dr. Watson in the play Sherlock Holmes by William Gillette at Broadhurst Theatre on Broadway (New York) with John Wood as Sherlock Holmes. 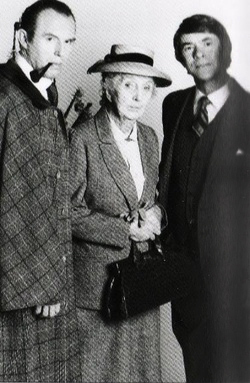 In 1986, he played Sherlock Holmes in the BBC radio show The Valley of Fear with Andrew Hilton as Dr. Watson. He also wrote 3 children's books in the series The Baker Street Mysteries, featuring the exploits of Sherlock Holmes' Baker Street Irregulars : The Dragon Tattoo (2008), Shadow of Evil and The Rose of Africa (2009). This page was last edited on 30 January 2019, at 21:42.